The drug also has been used IV for empiric antifungal therapy in febrile neutropenic patients, for chronic suppressive or maintenance therapy (secondary prophylaxis) to prevent recurrence or relapse of cryptococcosis, histoplasmosis, or coccidioidomycosis in individuals with human immunodeficiency virus (HIV) infection, or for prevention of fungal infections in other immunocompromised individuals (e.g., cancer patients, bone marrow or solid organ transplant patients). In addition, conventional IV amphotericin B is used for the treatment of certain protozoal infections, including leishmaniasis and primary amebic meningoencephalitis caused by Naegleria fowleri. Conventional IV amphotericin B should be used principally in patients with progressive, potentially life-threatening fungal infections and should not be used to treat noninvasive fungal infections (e.g., oral thrush, vaginal candidiasis, esophageal candidiasis) in immunocompetent patients with normal neutrophil counts. When necessary, conventional amphotericin B has been administered intrathecally (either alone or in conjunction with IV administration) for the treatment of CNS infections caused by susceptible fungi. The drug also has been used as a local irrigant for the treatment of candidal cystitis; administered as an oral suspension for the treatment or prophylaxis of fungal infections in neutropenic patients; administered intraperitoneally for the treatment of fungal peritonitis; and given intrabronchially or by nebulization for the treatment or prophylaxis of pulmonary fungal infections. Amphotericin B cholesteryl sulfate complex currently is labeled for the treatment of invasive aspergillosis in patients who fail to respond to conventional IV amphotericin B or who cannot receive effective doses of conventional amphotericin B because of renal impairment or unacceptable toxicity; the drug also is being investigated for use in the treatment of other invasive fungal infections (e.g., candidiasis, cryptococcosis, histoplasmosis, mucormycosis), for antifungal treatment or prophylaxis in febrile neutropenic patients, and for the treatment of visceral leishmaniasis(kala-azar). Amphotericin B lipid complex is labeled for use in the treatment of invasive fungal infections in patients who are refractory to or intolerant of conventional IV amphotericin B.
Amphotericin B liposomal currently is labeled for use in the treatment of infections caused by Aspergillus, Candida, or Cryptococcus that are refractory to conventional IV amphotericin B and for the treatment of these infections in patients who cannot receive conventional amphotericin B because of renal impairment or unacceptable toxicity. Amphotericin B liposomal also is labeled for treatment of cryptococcal meningitis in HIV-infected patients, empiric therapy of presumed fungal infections in febrile, neutropenic patients, and for the treatment of visceral leishmaniasis. Conventional IV amphotericin B traditionally has been considered the drug of choice for the treatment of invasive infections caused by susceptible fungi. While some azole antifungal agents (e.g., itraconazole, fluconazole) are now also recognized as drugs of choice for the treatment of many systemic mycoses, IV amphotericin B remains the drug of first choice for the initial treatment of severe, life-threatening fungal infections, especially in immunocompromised patients. Clinical experience with the newer formulations of amphotericin B (amphotericin B cholesteryl sulfate complex, amphotericin B lipid complex, amphotericin B liposomal) has been obtained principally from small, open-label studies and case reports and, because of limited experience to date, these formulations generally have been reserved for second-line therapy in patients who have invasive fungal infections that have not responded to conventional amphotericin B or for use in patients who cannot receive the conventional formulation because of intolerance. The newer lipid-based and liposomal formulations of amphotericin B generally appear to be better tolerated (e.g., lower incidence of acute infusion reactions and adverse hematologic and renal effects) than conventional amphotericin B and a few studies have been completed and more have been initiated to evaluate their use as first-line therapy; however, further study is needed to determine the relative efficacy of newer formulations of amphotericin B compared with that of conventional IV amphotericin B in the treatment of severe, potentially life-threatening fungal infections. IV amphotericin B is considered the drug of choice for the treatment of invasive aspergillosis in adult and pediatric patients. 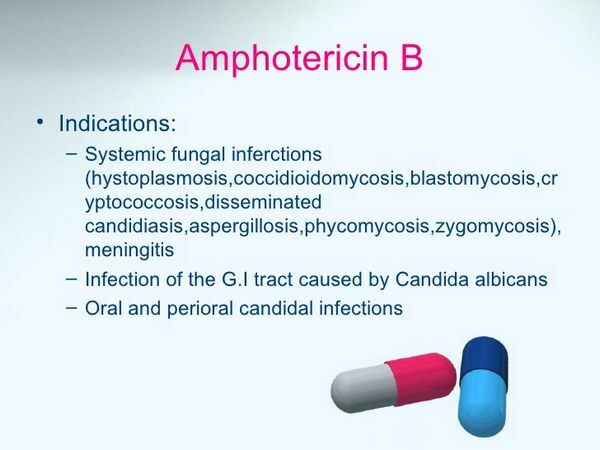 Amphotericin B generally is indicated for severe pulmonary and disseminated infections, (e.g., endocarditis, osteomyelitis, CNS, ocular, cutaneous), but not for allergic bronchopulmonary aspergillosis or other noninvasive forms of the disease. Invasive aspergillosis (especially in immunocompromised patients) is difficult to diagnose and treat, and the overall response rate of invasive aspergillosis to conventional IV amphotericin B has been highly variable ranging from 14-83%. In some patients with invasive aspergillosis (e.g., CNS, endocarditis) that does not respond to conventional IV amphotericin B therapy alone, the drug has been used concomitantly with flucytosine or rifampin; however, it is unclear whether these combination regimens offer any benefit over use of amphotericin B alone and there are concerns related to possible drug interactions between amphotericin B and flucytosine. There is some evidence that concomitant use of conventional amphotericin B and itraconazole (generally administered sequentially) may be associated with a better response rate than use of conventional amphotericin B alone in immunocompromised patients (e.g., patients with acute myelogenous leukemia) with invasive pulmonary aspergillosis; however, there also are concerns related to possible drug interactions between amphotericin B and itraconazole. Amphotericin B cholesteryl sulfate complex, amphotericin B lipid complex, and amphotericin B liposomal also are used in the treatment of invasive aspergillosis and have been effective when used in patients who did not respond to or were intolerant of conventional IV amphotericin B. Aspergillus osteomyelitis of the spine in a 10-year old child with chronic granulomatous disease was effectively treated with a regimen of amphotericin B lipid complex (2.5 mg/kg on day 1 followed by 5 mg/kg daily for 27 weeks) administered concomitantly with oral itraconazole (400 mg daily); the patient also received interferon alpha and granulocyte infusions.In several studies involving patients with invasive aspergillosis, the response rates to amphotericin B cholesteryl sulfate complex, amphotericin B lipid complex, or amphotericin B liposomal have ranged from 32-69%. Further study is needed to evaluate the comparative efficacy of the various amphotericin B formulations when used for first-line treatment of aspergillosis. Results of a controlled, randomized study comparing the relative safety and efficacy of conventional IV amphotericin B and amphotericin B cholesteryl sulfate complex for initial therapy of aspergillosis are pending. Infections caused by Aspergillus are a major cause of morbidity and mortality in immunocompromised patients and, although further study is necessary, use of conventional amphotericin B administered as low-dose IV therapy or by nasal instillation or inhalation is being investigated to determine whether such therapy is effective for prophylaxis of aspergillosis in these patients. IV amphotericin B is used for the treatment of North American blastomycosis caused by Blastomyces dermatitidis. While both oral itraconazole and IV amphotericin B are considered drugs of choice and oral fluconazole or oral ketoconazole are considered alternative agents for the treatment of blastomycosis, amphotericin B is preferred for the treatment of severe infections, especially those involving the CNS. Some clinicians suggest that amphotericin B therapy can be changed to oral itraconazole after the patient has stabilized. The fact that treatment failures have been reported when an oral antifungal agent (e.g., ketoconazole) was used in the treatment of cutaneous or pulmonary blastomycosis in patients who had asymptomatic or subclinical CNS involvement at the time of the initial diagnosis should be considered when selecting an antifungal agent for patients with blastomycosis. Blastomycosis in immunocompromised individuals (e.g., HIV-infected individuals, transplant recipients, patients receiving immunosuppressive agents) may be more aggressive and more often fatal (30-40% mortality rate) than disease in immunocompetent individuals and early and aggressive treatment with amphotericin B is recommended for these individuals. HIV-infected individuals with pulmonary blastomycosis or disseminated disease involving multiple visceral organs and the CNS have responded to conventional IV amphotericin B, and some clinicians consider amphotericin B to be the drug of choice for the initial treatment of presumptive blastomycosis in these patients. It has been suggested that HIV-infected individuals with blastomycosis should receive follow-up therapy with an oral azole antifungal agent (e.g., itraconazole) after an initial response is obtained with IV amphotericin B.
IV amphotericin B is used in the treatment of disseminated or invasive infections caused by Candida, including candidemia, endocarditis, meningitis, arthritis, peritonitis, and intraabdominal abscesses, and generally is effective against infections caused by C. albicans, C. glabrata, C. krusei,C. parapsilosis, or C. tropicalis. Both IV amphotericin B and IV or oral fluconazole are considered drugs of choice for systemic invasive candidiasis; however, optimal antifungal regimens for these infections have been difficult to identify and there are drawbacks associated with each agent. While fluconazole may be better tolerated and easier to administer than IV amphotericin B, fluconazole-resistant C. albicans are being isolated with increasing frequency from patients who have received prior fluconazole therapy (especially in HIV-infected patients) and some candidal infections (e.g., candidemia) are increasingly caused by candidal strains that are intrinsically resistant to fluconazole (e.g., C. krusei) or likely to be fluconazole resistant (e.g., C. glabrata). The choice of antifungal agent for the initial treatment of invasive candidal infections should take into consideration local and/or institutional epidemiologic data regarding prevalence of the various candidal strains and their patterns of resistance, the colonization status of the patient, severity and duration of neutropenia or immunosuppression, and history relating to prior fluconazole use. If the causative organism is known or likely to be C. krusei, most clinicians recommend use of IV amphotericin B; however, fluconazole is preferred if the infection is caused by C. lusitaniae. Because candidemia is associated with substantial morbidity and risk of long-term sequelae, antifungal agent therapy generally is recommended for all patients with candidemia (regardless of whether they are neutropenic or nonneutropenic) in addition to removal and/or exchange of any intravascular catheters. It has been suggested that oral fluconazole may be preferred over IV amphotericin B for the treatment of candidemia in nonneutropenic patients (both stable and unstable patients) unless there is evidence that the infection is caused by fluconazole-resistant strains or the patient previously received fluconazole. IV amphotericin B generally is preferred for the treatment of severe candidemia in patients who have infections caused by strains that may be fluconazole-resistant (e.g., C. krusei, C. glabrata), patients who have recently received fluconazole, and immunocompromised patients such as those with HIV infection. In one controlled study in patients with candidemia who were immunocompetent and had normal neutrophil counts, the response to conventional IV amphotericin B therapy (0.5-0.6 mg/kg daily for 7 days then 3 times weekly for an additional 10 days) or fluconazole therapy (400 mg daily given IV for 7 days then orally for an additional 11 days) was similar and both regimens appeared to be equally effective. The overall response rate to a regimen of conventional IV amphotericin B or oral fluconazole also was similar in a prospective, randomized study that included both nonneutropenic and neutropenic patients with documented or presumed invasive candidiasis. However, further study is needed to more fully evaluate the relative efficacy of amphotericin B and fluconazole in immunocompromised patients or patients with severe infections. For the initial treatment of certain severe candidal infections (e.g., candidemia in neutropenic or nonneutropenic patients who are clinically unstable or have evidence of deep-organ involvement, CNS infections, chronic disseminated candidiasis [hepatosplenic candidiasis]), some clinicians suggest that the response rate to IV amphotericin B may be improved if the drug is administered concomitantly with flucytosine (especially in neutropenic patients or patients with C. tropicalis infections); however, such combination therapy is controversial because of concerns related to possible drug interactions between the drugs. Mucocutaneous or noninvasive candidal infections such as oral thrush, esophageal candidiasis, or vaginal candidiasis usually can be adequately treated with oral antifungal agents (e.g., fluconazole, ketoconazole, itraconazole) or topical antifungal therapy (e.g., clotrimazole oral lozenges, nystatin oral suspension, amphotericin B oral suspension); however, severe mucocutaneous candidiasis, infections caused by azole-resistant Candida, or infections that fail to respond to such therapy may require IV amphotericin B therapy. Conventional amphotericin B has been administered by bladder irrigation for the treatment of candiduria. Antifungal agent therapy is not necessarily indicated to treat asymptomatic candiduria, but may be indicated in patients who have symptoms or rapidly worsening underlying disease, patients undergoing renal transplantation, low-birthweight infants, patients undergoing urologic manipulations, or patients with factors that predispose them to persistent candiduria (e.g., neutropenia, diabetic mellitus, urinary catheterization). While oral fluconazole (with or without flucytosine) has been recommended for the treatment of uncomplicated candidal endophthalmitis, IV amphotericin B (with or without flucytosine) is recommended by some clinicians for the treatment candidal endophthalmitis, especially when lesions are advancing rapidly or threaten the macula. Conventional IV amphotericin B (with or without flucytosine) has been used in the treatment of chronic disseminated candidiasis (hepatosplenic candidiasis) in immunocompromised patients (e.g., leukemia patients). Amphotericin B lipid complex has been effective when used in pediatric cancer patients with chronic disseminated candidiasis or other candidal infections. Amphotericin B cholesteryl sulfate complex or liposomal amphotericin B has been used effectively for the treatment of disseminated candidal infections, and the overall response rate in patients with candidiasis who received either of these formulations has been reported to be 56-70%. IV amphotericin B is used for the treatment of coccidioidomycosis caused by Coccidioides immitis. While acute pulmonary coccidioidomycosis may be self-limiting and resolve spontaneously without specific antifungal therapy, severe pulmonary infections or disseminated coccidioidomycosis involving the skin, bone, meninges, and joints are associated with a high fatality rate and must be treated with aggressive antifungal agent therapy. Conventional IV amphotericin B or oral fluconazole are both considered drugs of choice for the treatment of coccidioidomycosis, and oral itraconazole or oral ketoconazole are considered alternative agents. IV amphotericin B generally is preferred for the initialtreatment of severe coccidioidomycosis, especially in immunocompromised patients including those with HIV infection. While data regarding use of lipid-based formulations of amphotericin B in the treatment of coccidioidomycosis are limited to date, amphotericin B cholesteryl sulfate complex and amphotericin B lipid complex have been used with some success in a limited number of patients for the treatment of this infection. For the treatment of coccidioidal meningitis, conventional amphotericin B may be ineffective if given only by the IV route and intrathecal administration via lumbar or cisternal injection or subcutaneously placed ventricular reservoir (Ommaya reservoir), in conjunction with IV administration, usually is necessary. Fluconazole has been used effectively for the treatment of coccidioidal meningitis in some HIV-infected patients, and some clinicians suggest that it is the preferred drug for initial therapy of coccidioidal meningitis but that intrathecal amphotericin B should be substituted or added to the regimen in patients who do not respond to fluconazole. While oral fluconazole generally is preferred, conventional IV amphotericin B is used as an alliterative for long-term suppressive or maintenance therapy (secondary prophylaxis) in HIV-infected adults, adolescents, and pediatric patients who have had documented, adequately treated coccidioidomycosis. IV amphotericin B is used for the treatment of infections caused by Cryptococcus neoformans, and generally is considered the initial treatment of choice, especially for the treatment of cryptococcal meningitis. Because of reported in vitro and in vivo synergism, many clinicians advocate concomitant use of amphotericin B and flucytosine for the initial treatment of cryptococcal infections, especially in HIV-infected patients. Addition of flucytosine to the regimen may reduce the time required for sterilization of CSF in those with CNS involvement, but may not improve clinical outcome in all patients. Because flucytosine often is poorly tolerated in HIV-infected patients, it has been recommended that the drug be used in conjunction with amphotericin B only until the patient has stabilized and that serum flucytosine concentrations and blood cell counts be monitored closely. Although IV amphotericin B (with or without concomitant flucytosine) generally has been considered the regimen of choice for initial treatment of cryptococcal meningitis, fluconazole (with or without flucytosine) is used as an alternative for these infections in patients who do not have HIV and whose disease is less severe since the drug generally is well tolerated and is distributed into CSF in high concentrations. Fluconazole has been effective in the treatment of acute cryptococcal meningitis and other cryptococcal infections in some patients who failed to respond to IV amphotericin B therapy, but may be less effective than IV amphotericin B during early therapy of acute cryptococcal meningitis in patients with AIDS and may produce slower sterilization of CSF. In a randomized, multicenter study comparing conventional IV amphotericin B (mean dose of 0.4-0.5 mg/kg daily for 10 weeks with or without concomitant flucytosine) with oral fluconazole (400 mg on day 1 followed by 200-400 mg daily for 10 weeks) in HIV-infected patients with cryptococcal meningitis, therapy was effective in 40% of patients receiving amphotericin B and in 34% of those receiving fluconazole. Although overall mortality between patients receiving conventional amphotericin B and patients receiving fluconazole was similar (14% in patients receiving amphotericin B versus 18% in patients receiving fluconazole), mortality was higher during the first 2 weeks of therapy in patients receiving fluconazole (15% versus 8% in those receiving amphotericin B). CSF cultures were positive for an average of about 42 or 64 days in patients receiving conventional amphotericin B or fluconazole, respectively. In a double-blind multicenter trial in patients with AIDS-associated cryptococcal meningitis, the relative efficacy of initial therapy with conventional IV amphotericin B (0.7 mg/kg daily) given with flucytosine (100 mg/kg daily) or placebo for 2 weeks followed by oral fluconazole (800 mg daily for 2 days, then 400 mg daily for 8 weeks) or oral itraconazole (600 mg daily for 3 days, then 400 mg daily for 8 weeks) was evaluated. At 2 weeks, CSF cultures were negative in 60% of those who received amphotericin B with concomitant flucytosine compared with 51% of those who received amphotericin B alone. The clinical response to oral fluconazole or oral itraconazole for follow-up therapy was similar, but the rate of CSF sterilization at 10 weeks was higher in those who received fluconazole (72%) compared with those who received itraconazole (60%). For this reason, many clinicians now recommend that treatment of cryptococcal meningitis in HIV-infected patients be initiated with a regimen of amphotericin B (with flucytosine) given for at least 2 weeks (or until the patient’s condition is stabilized) followed by a regimen of oral fluconazole or oral itraconazole administered for at least an additional 8-10 weeks or longer. Both conventional IV amphotericin B and oral fluconazole have been effective when used for suppressive or maintenance therapy (secondary prophylaxis) to prevent relapse of cryptococcal meningitis in HIV-infected patients. Results of a multicenter study comparing safety and efficacy of conventional IV amphotericin B (1 mg/kg once weekly) or oral fluconazole (200 mg once daily) for prevention of relapse of the disease in HIV-infected patients who have negative cryptococcal cultures after initial adequate amphotericin B therapy indicate that the fluconazole regimen is more effective (in terms of preventing relapse of culture-positive meningitis) and better tolerated than the amphotericin B regimen for maintenance therapy in these patients. Therefore, while oral fluconazole generally is preferred, IV amphotericin B is used as an alternative for long-term suppressive or maintenance therapy (secondary prophylaxis) in HIV-infected adults, adolescents, and pediatric patients who have documented, adequately treated cryptococcosis. Amphotericin B cholesteryl sulfate complex has been used effectively to treat cryptococcal meningitis in a limited number of patients who could not tolerate conventional IV amphotericin B, including a few patients with diabetes mellitus, chronic liver disease, or HIV infection. 220 These patients previously received 6-8 days of conventional IV amphotericin B and additional study is needed to determine whether amphotericin B cholesteryl sulfate complex would be as effective as conventional amphotericin B for initial therapy in patients with cryptococcal meningitis. Amphotericin B lipid complex also is used for the treatment of cryptococcal meningitis. In a study evaluating safety and efficacy of amphotericin B lipid complex for the treatment of cryptococcal meningitis in HIV-infected patients, the lipid-based formulation was at least as effective as conventional IV amphotericin B for initial therapy in these patients and was associated with less hematologic and renal toxicity than the conventional formulation. An initial clinical response was obtained in 86% of patients who received amphotericin B lipid complex (5 mg/kg once daily during weeks 1 and 2, and 3 times weekly during weeks 3-6) and in 65% of those who received conventional IV amphotericin (0.7 mg/kg during weeks 1 and 2, and 1.2 mg/kg 3 times weekly during weeks 3-6); all patients received follow-up therapy with oral fluconazole for an additional 12 weeks). The overall response rate (resolution of all signs and symptoms and conversion of CNS, blood, and urine cultures to negative) was 38% in those who received amphotericin B lipid complex and 41% in those who received conventional IV amphotericin B.
Amphotericin B liposomal is used to treat cryptococcal infections in patients who fail to respond to or cannot tolerate conventional amphotericin B and also is used as initial therapy in HIV-infected patients with cryptococcal meningitis. Amphotericin B liposomal was compared with conventional amphotericin B for empiric treatment of cryptococcal meningitis in HIV-infected patients in a randomized, double-blind study in 267 patients (study 94-0-013). Patients were randomized to receive 11-21 days of amphotericin B liposomal (3 or 6 mg/kg daily) or conventional amphotericin B (0.7 mg/kg daily); this induction regimen was followed by oral fluconazole (400 mg daily for adults and 200 mg daily in a pediatric patient younger than 13 years of age) given to complete 10 weeks of protocol-directed therapy. At 2 weeks, the success rate (defined as CSF culture conversion) for mycologically evaluable patients (defined as all randomized patients who received at least 1 dose of study drug, had positive baseline CSF culture, and at least 1 follow-up culture) was 47.% in those who received conventional amphotericin B and 58. or 48% in those who received amphotericin B liposomal in a dosage of 3 or 6 mg/kg daily, respectively. At 10 weeks, the success rate (defined as clinical success at week 10 plus CSF culture conversion at or prior to week 10) in those with documented cryptococcal meningitis at baseline was 53% in those who received conventional amphotericin B and 49% in those who received amphotericin B liposomal in a dosage of 6 mg/kg daily; the success rate was only 37% in those who received the lower dosage of amphotericin B liposomal. The survival rate at 10 weeks was similar in those receiving conventional amphotericin B (89%) or the higher dosage of amphotericin B liposomal (90%); the incidence of adverse effects (infusion reactions or adverse cardiovascular or renal effects) was lower in those receiving amphotericin B liposomal than in those receiving conventional amphotericin B. In another randomized study in HIV-infected patients with cryptococcal meningitis who received a 3-week course of liposomal amphotericin B (4 mg/kg daily) or a 3-week course of conventional IV amphotericin B (0.7 mg/kg daily) followed by a 7-week course of oral fluconazole (400 mg daily), the median time to negative CSF cultures was 7-14 days in those receiving amphotericin B liposomal compared with more than 21 days in those receiving conventional IV amphotericin B.
IV amphotericin B is used for the treatment of disseminated histoplasmosis caused by Histoplasma capsulatum. Both IV amphotericin B and oral itraconazole are considered drugs of choice for the treatment of histoplasmosis, and oral ketoconazole and oral fluconazole are considered alternative agents. However, IV amphotericin B generally is preferred for the initial treatment of severe, life-threatening histoplasmosis, especially in immunocompromised patients such as those with HIV infection. Itraconazole may be used in the initial treatment of mild to moderate infections or as follow-up therapy in the treatment of severe infections after a response has been obtained with amphotericin B.In the treatment of meningitis caused by H. capsulatum, conventional amphotericin B has been administered IV alone or in conjunction with intrathecal administration of the drug. While oral itraconazole generally is preferred, conventional IV amphotericin B is used as an alternative for long-term suppressive or maintenance therapy (secondary prophylaxis) in HIV-infected adults, adolescents, and pediatric patients who have documented, adequately treated histoplasmosis. IV amphotericin B is used for the treatment of paracoccidioidomycosis (South American blastomycosis) caused by Paracoccidioides brasiliensis. Because of the shorter duration of treatment required and better toxicity profile, some clinicians suggest that oral itraconazole is the drug of choice for the treatment of paracoccidioidomycosis; however, IV amphotericin B generally is preferred for the initial treatment of severe cases. A variety of drugs have been used to treat paracoccidioidomycosis in HIV-infected individuals (e.g., co-trimoxazole, conventional amphotericin B, ketoconazole, itraconazole); despite such therapy, the overall mortality rate resulting from these fungal infections has been about 30%. While the most effective antifungal regimen for the treatment of paracoccidioidomycosis in HIV-infected individuals has not been identified, some clinicians recommend that these patients receive initial therapy with IV amphotericin B. It has been suggested that HIV-infected patients treated for paracoccidioidomycosis should then receive long-term suppressive therapy for prophylaxis against recurrence or relapse using a less toxic agent such as co-trimoxazole or itraconazole; such prophylaxis is not addressed in current US Public Health Service and the Infectious Diseases Society of America (USPHS/IDSA) guidelines for the prevention of opportunistic infections in individuals infected with HIV. IV amphotericin B is used in the treatment of disseminated, pulmonary, osteoarticular, and meningeal sporotrichosis caused by Sporothrix schenckii. Both IV amphotericin B and oral itraconazole are considered drugs of choice for systemic sporotrichosis, and fluconazole is an alternative agent. IV amphotericin B is not usually indicated for the treatment of cutaneous, lymphocutaneous, or mild pulmonary or osteoarticular sporotrichosis since these forms of the disease generally can be treated with oral itraconazole. While oral itraconazole may be effective in some patients with pulmonary or disseminated sporotrichosis, IV amphotericin B is the drug of choice for the initial treatment of severe, life-threatening infections and whenever there is CNS involvement; therapy can be changed to itraconazole after a response has been obtained with amphotericin B. Since sporotrichosis in immunocompromised patients (e.g., HIV-infected individuals) is particularly aggressive and difficult to treat, IV amphotericin B probably is the drug of choice for initial therapy in these patients; however, treatment failures occur. Some clinicians recommend that HIV-infected patients who have been treated for sporotrichosis receive lifelong suppressive therapy with oral itraconazole to prevent relapse; such prophylaxis is not addressed in current USPHS/IDSA guidelines for the prevention of opportunistic infections in individuals infected with HIV. 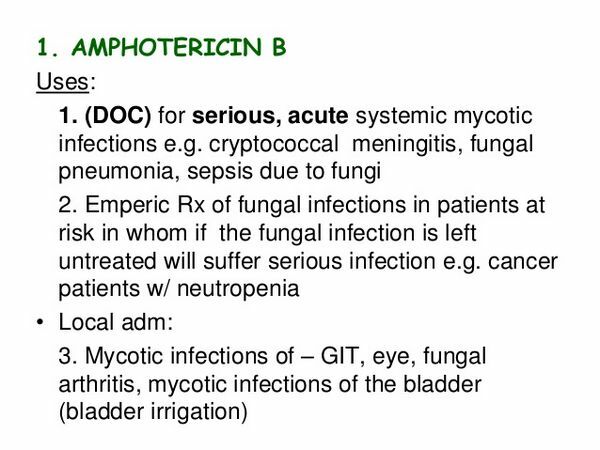 IV amphotericin B is used for the treatment of zygomycosis, including mucormycosis, caused by susceptible species of Absidia, Mucor, or Rhizopus and infections caused by susceptible species of Conidiobolus or Basidiobolus, and generally has been considered the drug of choice for these infections. However, in several cases of GI basidiobolomycosis caused by Basidiobolus ranarum, the response to amphotericin B (e.g., amphotericin B liposomal) was poor. Most cases of GI basidiobolomycosis reported to date have been successfully treated with oral itraconazole after partial surgical resection of the GI tract. While most experience to date in treating zygomycosis has involved use of conventional IV amphotericin B, amphotericin B cholesteryl sulfate complex, amphotericin B lipid complex, and amphotericin B liposomal also have been used to treat these infections, including rhinocerebral and pulmonary mucormycosis, in patients who did not respond to conventional amphotericin B or had to discontinue conventional amphotericin B because of adverse renal effects. In at least one pediatric leukemia patient, disseminated mucormycosis was effectively treated with amphotericin B liposomal. Amphotericin B lipid complex used in conjunction with extensive local debridement was effective in at least one immunocompromised patient with cutaneous Apophysomyces elegans infection. Conventional IV amphotericin B, amphotericin B cholesteryl sulfate complex, and amphotericin B liposomal are used for empiric therapy of presumed fungal infections in febrile, neutropenic patients including cancer patients and bone marrow transplant (BMT) or solid organ transplant recipients. Fungal infections usually occur as secondary infections in febrile, neutropenic patients who have received broad-spectrum anti-infectives; however, in some cases, fungi cause primary infections in these patients. Because systemic fungal infections (e.g., Candida, Aspergillus) are present in at least one-third of neutropenic patients who remain febrile after a 7-day course of empiric broad-spectrum anti-infective therapy, the IDSA and other clinicians recommend that consideration be given to administering empiric IV amphotericin B therapy (with or without a change in the antibiotic regimen) to neutropenic patients who have persistent or recurrent fever after 5-7 days of antibiotic therapy. The IDSA recommends that, prior to initiation of empiric IV amphotericin B therapy, every effort should be made to determine whether a systemic fungal infection exists (e.g., obtain cultures, biopsy lesions, obtain chest and sinus radiographs, perform nasal endoscopy, perform serologic tests for antibodies and antigens, perform CT scan of abdomen and chest). Empiric therapy with conventional IV amphotericin B commonly is used in BMT patients who have persistent fever despite 3-7 days of broad-spectrum anti-infective therapy, and such therapy is included in the Eastern Cooperative Oncology Group (ECOG) recommended guidelines for the management of autologous and allogeneic BMT patients. If conventional IV amphotericin B is used for empiric antifungal therapy in febrile, neutropenic allogeneic BMT patients who are receiving cyclosporine, the potential for additive nephrotoxic effects should be considered before initiating such therapy. Efficacy of amphotericin B cholesteryl sulfate complex for empiric therapy in febrile neutropenic patients has been evaluated in a randomized, double-blind study in adults and pediatric patients 2 years of age or older (6 patients younger than 2 years were included outside of study protocol) who were neutropenic following chemotherapy or BMT or stem cell transplantation. In the double-blind study, patients received conventional IV amphotericin B (0.8 mg/kg daily) or IV amphotericin B cholesteryl sulfate complex (4 mg/kg daily) for a median duration of 8 days. A response was obtained in 43 or 50% of those receiving conventional amphotericin B or amphotericin B cholesteryl sulfate complex, respectively; fungal infections were documented or suspected during or within 7 days after administration of the study drug in 14.7 or 14.3%, respectively, and such infections were documented in 3.2 or 3.1%, respectively. Results of this study indicate that amphotericin B cholesteryl sulfate complex is as effective as conventional amphotericin B for empiric treatment of febrile neutropenic patients and is associated with a lower incidence of adverse renal effects; however, acute infusion reactions including chills and hypoxia occurred more frequently in those receiving the lipid-based preparation. The relative efficacy of conventional IV amphotericin B and amphotericin B liposomal for empiric therapy in febrile, neutropenic patients has been evaluated in a randomized, double-blind, multicenter study that involved 687 adult and pediatric cancer patients 2-80 years of age who were febrile despite having received at least 5 days of empiric therapy with broad spectrum anti-infective agents. The overall therapeutic success rate (defined as resolution of fever during the neutropenic period, successful treatment of any baseline fungal infections, absence of emergent fungal infections during therapy or within 7 days after completion of study drug, patient survival for at least 7 days after empiric therapy, and use of study drug without premature discontinuance because of toxicity or lack of efficacy) was 50.1% for amphotericin B liposomal and 49.4% for conventional amphotericin B. Emergent fungal infections were mycologically confirmed in 3.2% of those receiving amphotericin B liposomal and in 7.8% of those receiving conventional amphotericin B. While the overall success rate was similar in both groups, the group receiving amphotericin B liposomal had a lower incidence of documented emergent fungal infections and also had a lower incidence of acute infusion reactions and adverse renal effects than those receiving conventional amphotericin B.
Amphotericin B liposomal also appeared to be as effective as conventional IV amphotericin B for empiric therapy of presumed fungal infections in several randomized, open label, multicenter studies that involved febrile neutropenic adults and pediatric patients undergoing chemotherapy for hematologic malignancy or as part of bone marrow transplantation. Conventional IV amphotericin B is used as an alternative agent for long-term suppressive or maintenance therapy (secondary prophylaxis) to prevent recurrence or relapse of coccidioidomycosis, cryptococcosis, or histoplasmosis in HIV-infected individuals who have received adequate treatment of these infections. The Prevention of Opportunistic Infections Working Group of the US Public Health Service and the Infectious Diseases Society of America (USPHS/IDSA) has established guidelines for the prevention of opportunistic infections, including fungal infections, in HIV-infected individuals that include recommendations concerning prevention of exposure to opportunistic pathogens, prevention of first disease episodes, and prevention of disease recurrence. The USPHS/IDSA currently recommends that HIV-infected individuals who have completed initial therapy for documented coccidioidomycosis, cryptococcosis, or histoplasmosis receive long-term suppressive or maintenance therapy (secondary prophylaxis) to prevent recurrence or relapse of these fungal infections. For HIV-infected adults, adolescents, infants, or children who have had documented coccidioidomycosis or cryptococcosis that has been adequately treated, USPHS/IDSA recommends oral fluconazole as the drug of choice for suppressive or maintenance therapy (secondary prophylaxis) and conventional IV amphotericin B and oral itraconazole as alternatives. For HIV-infected adults, adolescents, infants, and children who have had documented and adequately treated histoplasmosis, the USPHS/IDSA recommends oral itraconazole as the drug of choice for suppressive or maintenance therapy (secondary prophylaxis) and conventional IV amphotericin B as an alternative. Because of concerns regarding use of azole antifungal agents (e.g., fluconazole, itraconazole) during pregnancy, conventional IV amphotericin B may be the preferred agent if suppressive or maintenance therapy against coccidioidomycosis, cryptococcosis, or histoplasmosis is indicated in an HIV-infected pregnant woman, especially during the first trimester. Long-term suppressive or maintenance therapy to prevent recurrence or relapse of fungal infections in HIV-infected patients generally is continued for life. Although HIV-infected patients receiving suppressive antifungal prophylaxis may be at low risk for recurrence of fungal infections if their CD4+ T-cell count increases to greater than 100/mm3 while receiving potent combination antiretroviral agent therapy, the USPHS/IDSA states that data are insufficient to date to warrant a recommendation regarding discontinuance of prophylaxis against coccidioidomycosis or histoplasmosis in these individuals. However, limited data indicate that discontinuing suppressive or maintenance therapy in HIV-infected adults and adolescents who have successfully completed initial therapy for cryptococcosis, remain asymptomatic with respect to cryptococcosis, and have sustained (e.g., for 6 months or longer) increases in CD4+ T-cell counts to greater than 100-200/mm3 in response to potent antiretroviral therapy is associated with a low risk for recurrence of cryptococcosis. Based on this data and more extensive cumulative data on safety of discontinuing long-term suppressive therapy for other opportunistic infections, the USPHS/IDSA states that it is reasonable to consider discontinuation of suppressive or maintenance therapy in adults or adolescents meeting these criteria. The USPHS/IDSA notes that recurrences could occur in individuals discontinuing therapy and states that suppressive or maintenance therapy should be restarted if the CD4+ T-cell count decreases to less than 100-200/mm3. The safety of discontinuing suppressive or maintenance therapy in HIV-infected infants and children has not been studied, and children should receive lifelong suppressive therapy after an episode of cryptococcosis. For further information on the USPHS/IDSA guidelines for primary prophylaxis or chronic suppressive or maintenance therapy (secondary prophylaxis) of fungal infections in HIV-infected individuals. IV amphotericin B or amphotericin B liposomal has been used prophylactically in an attempt to reduce the incidence of fungal infections (e.g., aspergillosis, candidiasis) in neutropenic cancer patients or patients undergoing BMT or solid organ transplantation. Use of primary antifungal prophylaxis in cancer patients undergoing myelosuppressive therapy or patients undergoing BMT or solid organ transplantation remains controversial, particularly since such prophylaxis may predispose the patient to colonization with resistant fungi and/or result in the emergence of highly resistant organisms. Therefore, many clinicians discourage primary prophylaxis with antifungal agents except in certain carefully selected high-risk patients in whom potential benefits are expected to justify possible risks (e.g., patients in institutions that have a high incidence of fungal infections or circumstances where the frequency of systemic candidal infections is high). owever, widespread use of fluconazole for prophylaxis in immunocompromised patients may result in an increased incidence of colonization with fluconazole-resistant strains. When used for antifungal prophylaxis in cancer patients or patients undergoing BMT, conventional amphotericin B has been administered in usual IV dosages or, more frequently, as low-dose IV therapy (i.e., 0.1-0.25 mg/kg daily). Safety and efficacy of low-dose conventional IV amphotericin B for prophylaxis in neutropenic patients undergoing BMT have been evaluated in a prospective, randomized, placebo-controlled study. Patients undergoing autologous BMT were randomized to receive low-dose conventional IV amphotericin B (0.6 mg/kg daily) or placebo; any patient with persistent neutropenia and fever despite prophylaxis with low-dose amphotericin B and broad-spectrum antibacterial agent therapy was withdrawn from the study and given empiric therapy with a higher dosage of conventional IV amphotericin B (0.6 mg/kg daily). During the study, 8.8% of those receiving low-dose amphotericin B and 14.3% of those receiving placebo had mycologically confirmed fungal infections (Candida, Aspergillus); 6-week mortality was higher in those receiving placebo (11 deaths in those receiving placebo compared with 3 deaths in those receiving amphotericin B), but this difference did not appear to be related to fungal infections. Because there is some evidence that administration of low-dose conventional IV amphotericin B therapy to BMT patients can decrease the incidence posttransplant fungal infections, some clinicians suggest that secondary prophylaxis with low-dose conventional IV amphotericin B be considered for all transplant patients with a history of documented invasive aspergillosis since these patients are at risk for reactivation of the disease. However, there is evidence that prophylaxis with low-dose conventional IV amphotericin B may be ineffective in preventing posttransplant fungal infections in liver transplant patients since candidemia and invasive aspergillosis have been reported in liver transplant recipients receiving prophylaxis with conventional IV amphotericin B (0.5 mg/kg daily). Data are accumulating regarding use of amphotericin B liposomal for antifungal prophylaxis in neutropenic cancer patients or BMT or transplant patients. Safety and efficacy of amphotericin B liposomal (2 mg/kg 3 times weekly) for antifungal prophylaxis in patients undergoing chemotherapy or BMT have been evaluated in a double-blind, placebo-controlled study. Systemic or superficial fungal infections were suspected in 42 or 46% of those receiving amphotericin B liposomal or placebo, respectively; however, while there were mycologically confirmed fungal infections in 3.4% of those receiving placebo, there were none in those receiving amphotericin B liposomal prophylaxis. There was fungal colonization of at least one site (fungal pathogen isolated but not associated with clinical or other evidence of disease) in 20 or 40% of those receiving amphotericin B liposomal or placebo, respectively. The mortality rate was similar in both groups (14-15%). In a limited placebo-controlled study in liver transplant recipients, there was no evidence of posttransplant fungal infections in those who received 5 days of amphotericin B liposomal prophylaxis (1 mg/kg daily initiated at the time of transplantation); 16% of patients who received placebo developed C. albicans infections posttransplant. However, in another study in liver transplant recipients who received amphotericin B liposomal for antifungal prophylaxis (1 mg/kg daily initiated after transplant and continued for 7 days), the regimen appeared to effectively prevent Candida infections but several patients developed posttransplant Aspergillus infections that were fatal. Conventional amphotericin B also has been administered by nasal instillation or nebulization in an attempt to prevent aspergillosis in immunocompromised patients, including solid organ transplant recipients and neutropenic chemotherapy patients. In a limited study in lung transplant recipients, aspergillosis developed in 22% of patients who received amphotericin B by nebulization (6 mg 3 times daily for 4 months) beginning on day 1 after transplant and in 78% of patients who did not receive such prophylaxis. However, in a study involving 382 chemotherapy patients, amphotericin B prophylaxis (10 mg twice daily by inhalation beginning prior to the onset of neutropenia and continued until neutrophil recovery) did not have any appreciable effect on the incidence of aspergillosis or any beneficial effect on mortality in these patients. Conventional IV amphotericin B is used for the treatment of American cutaneous leishmaniasis caused by Leishmania braziliensis or L. mexicana and for mucocutaneous leishmaniasis caused by L. braziliensis. Cutaneous leishmaniasis may subside spontaneously; however, treatment generally is required if lesions are disabling or disfiguring or fail to heal within 6 months or when dissemination to mucosal leishmaniasis is likely (e.g., L. braziliensis infections). While pentavalent antimony compounds (e.g., sodium stibogluconate [not commercially available in the US] or meglumine antimonate [not commercially available in the US]) generally are considered the treatments of choice for leishmaniasis, IV amphotericin B or amphotericin B liposomal also are considered drugs of choice for these infections. It has been suggested that conventional amphotericin B may be the drug of choice for the treatment of advanced mucocutaneous leishmaniasis. Data are limited regarding use of lipid-based amphotericin B formulations in the treatment of cutaneous leishmaniasis, but amphotericin B cholesteryl sulfate complex, amphotericin B lipid complex, and amphotericin B liposomal have been used in a limited number of patients for the treatment of cutaneous or visceral leishmaniasis. At least one patient with cutaneous leishmaniasis unresponsive to meglumine antimonate therapy was successfully treated with a 2-week regimen of amphotericin B liposomal (1.5 mg/kg daily) followed by a 4-week regimen of conventional amphotericin B (3 mg/kg once weekly). Conventional IV amphotericin B or amphotericin B liposomal is used in the treatment of visceral leishmaniasis (kala-azar). While pentavalent antimony compounds generally have been considered the drugs of choice for the initial treatment of visceral leishmaniasis caused by L. donovani (usually endemic in Asia and Africa), L. infantum (usually endemic in the Mediterranean basin), or L. chagasi (usually endemic in Latin America), drug resistance and treatment failures are becoming increasingly common. Both IV amphotericin B and pentamidine are considered alternatives for the treatment of visceral leishmaniasis and have been effective in patients who failed to respond to antimony compounds. Conventional IV amphotericin B has been effective when used for the initial treatment of visceral leishmaniasis in HIV-infected patients and may be as effective as meglumine antimonate in these patients. Amphotericin B liposomal also has been effective when used for initial therapy of visceral leishmaniasis in several immunocompromised renal transplant recipients. Relapse of visceral leishmaniasis is common in immunocompromised patients regardless of the treatment regimen. Further study is needed to determine whether amphotericin B liposomal is more effective than conventional IV amphotericin B in patients with visceral leishmaniasis. In a group of patients with visceral leishmaniasis who were infected in the Mediterranean basin with documented or presumed L. infantum, amphotericin B liposomal was associated with an overall success rate (clearance with no relapse during a follow-up period of 6 months or longer) of 96.5% in immunocompetent patients. In patients who were immunocompromised, amphotericin B liposomal therapy was able to initially clear the infection in 94.7% of patients; however, the overall success rate was only 11.8% and there was a high rate of relapse in these patients. While it has been suggested that amphotericin B liposomal may have a role for long-term suppressive therapy to prevent relapse of visceral leishmaniasis in HIV-infected individuals, the efficacy and safety of repeated courses of amphotericin B liposomal or maintenance therapy with the drug in immunocompromised individuals has not been evaluated to date. Data are inconclusive regarding efficacy of amphotericin B liposomal for the treatment of infections caused by L. donovani or L. chagasi. Amphotericin B cholesteryl sulfate complex and amphotericin B lipid complex also are being investigated for the treatment leishmaniasis. A 7- to 10-day course of amphotericin B cholesteryl sulfate complex has been used effectively for initial therapy of Brazilian kala-azar, and a 5-day course of amphotericin B lipid complex has been used effectively to treat visceral leishmaniasis caused by L. donovani that failed to respond to or relapsed after treatment with an antimony compound. 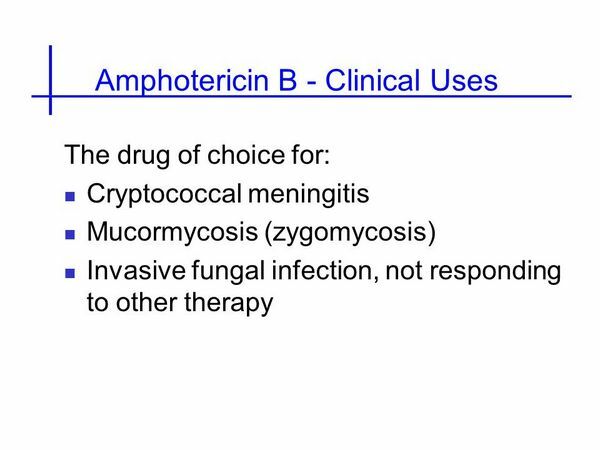 IV amphotericin B generally is considered the drug of choice for the treatment of primary amebic meningoencephalitis caused by Naegleria fowleri. The infection usually is rapidly fatal, but there have been a few reports of successful treatment with conventional amphotericin B used alone or in combination with other drugs (e.g., rifampin and chloramphenicol; rifampin and ketoconazole; miconazole [no longer commercially available], rifampin, and sulfadiazine). Concomitant IV and intrathecal therapy with conventional amphotericin B has been recommended, and there is a report of successful treatment of Naegleria infection with IV and intrathecal use of both amphotericin B and miconazole (no longer commercially available in the US), plus rifampin.